Friday February 8, 2019 - Deputy President William Ruto said on Friday that the real problems with elections in Kenya is people who do not accept election defeat. 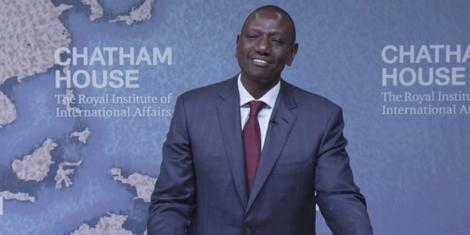 Speaking at Chatham House, United Kingdom, Ruto said most of these people use the electoral commission (IEBC) as a scapegoat. "... The problem is the people who refuse the outcome of elections. That is when they run amok. Going forward we should only allow democrats to participate in the elections," he said. The DP said those losers always use IEBC as an excuse for their failure. "I believe very strongly that in our politics, IEBC is the least of our problems. We have used IEBC as a convenient ‘excuse’ for those who do not win elections," said Ruto. Although he did not mention names, the DP seemed to be referring to NASA leader, Raila Odinga, who has in the past contested presidential election outcomes. In 2017, President Uhuru Kenyatta won the August 8th election but Raila objected the results at the Supreme Court, which invalidated the victory over adherence to electoral laws and the constitution. The court then ordered for fresh polls on October 26th in which Raila boycotted citing lack of reforms at the IEBC and gave a list of "irreducible minimums".